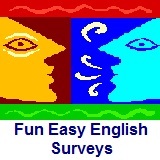 ﻿ Fun Easy English - new classroom free online classes english language lessons speaking listening writing reading january 1. Hey welcome to YOUR first day of Fun Easy English free classroom lessons. Today in the Fun Easy English classroom you are going to learn about New Year's resolutions. You will also learn the idiom lose weight. Visit the classroom every day, and at the end of this year, YOUR English will be perfect. Hi. In the classroom today you will learn a little about New Year’s Day and New Year's resolutions. New Year's Day is the first day of the year. On the modern calendar, it is celebrated on January 1st. New Year's Day is often celebrated with fireworks. Many people spend time thinking about the previous year. Still other people think about changes to be made in the New Year. These changes are called resolutions. A resolution is a commitment that an individual makes to themselves. These are a few of the most popular New Year’s resolutions. If you miss one day of your New Year’s resolution, don’t get discouraged. Simply continue on with your resolution the next day. Hi. In the classroom today you will learn the idiom, lose weight. When people go on a diet they typically say they are trying to LOSE WEIGHT. Many non-native English speakers often use this idiom incorrectly. They sometimes say they are trying to LOSE THEIR WEIGHT. This means they are trying to lose all their weight which means they would weigh nothing and not exist. 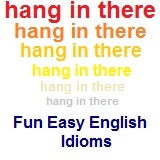 The correct way to say this idiom is you are trying to LOSE WEIGHT or you are trying to LOSE SOME WEIGHT. The correct usage of idioms is extremely important in English. Hey I thought since I am asking all of my students around the world to post their resolutions, it was only fair to post mine. Get fit - I am working out every day including walking, jogging, hiking, mountain bike riding, and now farming. Drink less alcohol - Yup I enjoy drinking wine with dinner and after but recently I am drinking a bit too much. I plan to reduce the amount of wine I drink every day. 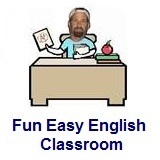 Work on Fun Easy English - I am planning many new and exciting lessons for all my students around the world this year. A new Year's resolution is a promise to yourself to make changes in the coming New Year. Many people use the New Year as a fresh beginning. A time to make personal changes resulting in a better year. PLEASE post a NEW YEARS GREETING for your Fun Easy English friends and post your NEW YEARS RESOLUTIONS in the Facebook Comments section below. This is good reading and writing practice and fun for others to read. 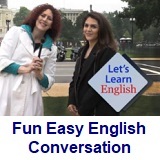 Be sure to come back EVERY DAY for a new Fun Easy English lesson. THANK YOU and GOOD LUCK with your English language studies. This is a collection of VOA conversation lessons for beginners. Each lesson has a conversation video, a video script, audio listening practice, video speaking practice, video pronunciation practice, writing activity, and new word section. In this introduction meet Anna Matteo, the star of the show. She is from a small town. It is nice, but there is no good job for her. She goes to Washington DC. She wants to learn about Washington. You want to learn English. She wants to learn together with you. Anna: It is nice, but there is no good job for me. Anna: I want to learn about Washington. Anna: You want to learn English. Conversation Lesson 1 - Welcome!